An Ensure, 2 Endurolyte capsules, a toasted bagel with Nutella, some OJ, an espresso, a shower and I was ready to go; or so I thought. During the Xmas break I had my cobbler resole my cold weather Sidi boots and never bothered to try them on with my rubber soled neoprene booties. Of course, as soon as I exited our building garage, with no time to spare, I went to click into the pedals and guess what, no go. The left shoe wouldn't engage onto the pedal. I had left my house keys on my nightstand, it was 7:06 and my wife was very much asleep. No choice but to ring the intercom for her to let me in, sorry. Back upstairs I dropped the neoprene booties got the fabric ones and out I was. It was now 7:09 and it usually takes ~20 minutes to ride the bike from my place to the bridge. We were starting the workers ride at 7:30 instead of the usual 7:00, did I mentioned the later start was at my request? Got there just in time to pick up my brevet card and chat for a few minutes with the other cyclists doing the ride. At 7:33 we started rolling. On the bridge I was able to catch up with Max P who is among the fastest SFR riders, in fact he is very fast. Jack H was also there but he was out just for a ride to Inverness and not doing the workers ride. We rode through the bike maze to Fairfax and then, on Whites Hill, I had to work a little harder than I would otherwise to keep Max within reach. It was cold! and now we were descending into San Geronimo Valley known for being cold and foggy. It did not disappoint us today. On that long stretch of road, Jack slowed down to wait for his rider partner. Max and I continued just stopping somewhere before Samuel P Taylor park to rescue a water bottle that, aided by the rough pavement, had decided to part ways with his bike. I hope one day I can tell friends I used to ride that section of road before they repaved it back in... yeah right. Before the Olema climb I told Max I would probably slow down a little from that point on and urged him not to wait for me. He waited for me at the top and then replied "no problem, it is nicer riding together". Traffic was light and there was no sign of rain, things were looking good. Again, before the hill following the town of Inverness, I repeated my "don't wait for me Max". This time the difference between us was too large and he continued at his pace. I was glad Max was now riding at his pace, I knew he had to be back home early and I did not want to be the one preventing that. Did a short stop to take off my neck warmer and continued then to the Lighthouse control. A few yards before the Lighthouse I saw Max again as he was leaving the control. Greg B. was manning the control, while I had two Endurolyte capsules and an Ensure we had a short chat. I thanked him and after a quick bathroom stop I was out to Marshall. I'll be seeing Greg later today when the wife and I go visit him in Point Reyes Station where he has been spending a few days. After about 10 minutes or so I started seeing other riders on their way to the Lighthouse. Hi! all and I wondered if I was riding too fast and would be fading soon. One of the nice things about doing the "workers rides", other than the satisfaction of volunteering, is experiencing the route with different eyes. Don't get me wrong, I really enjoy sharing miles with other randonneurs on regular brevets but when you do a workers ride your view of time, hills and valleys gets even more distorted than in the already twisted randonneuring reality. The other thing that you need to prepare yourself for is that most likely you will need to plan a little more for food supplies. Greg had ridden his bike to the control so it would have been too difficult for him to haul water for the expected 10+ volunteers riding; we all know how much water weighs. I needed to stop somewhere for water. Near Inverness I felt my backpack water bladder and I estimated it had about a full water bottle's worth of precious liquid in it, as a precaution I stopped at Perry's Deli in Inverness Park to buy some more. Note to new riders of this route: In the past I sometimes order a sandwich on the way to the light house and pick it up on the return, you can do the same but remember the clock is ticking and is more convenient to consolidate your stops as much as you can. It was getting colder or at least the temperature was not rising as one would expect by noon, get moving quickly!. This next segment of the route I like a lot, rollers and a nice view, even in the worst conditions. The heavy fog was now aided by mist. Once more I saw Max as I was getting closer to the control, just a few minutes difference this time (plus the time at the store). Another quick control at the Marshall store and after drinking my third Ensure for the day I was on the road again, freezing. No clam chowder for me, I regretted that decision the rest of the day. This time on my way out of Marshall I started seeing randonneurs on their way to town after about 15 minutes. Miles and cold weather were slowing us all down, still everybody smiled and shouted something when we crossed paths on Hwy 1. I had not printed the route cue sheet and now had doubts if the route went all the way to Nicasio or if we used Platform Bridge for the return. The latter is a little shorter and mostly flat but I often encounter head winds. 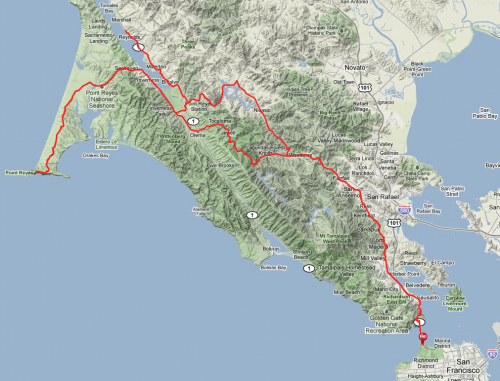 I chose to go to Nicasio as that was the route I felt was "official". BTW, yes it was. One more stop at Nicasio for a restroom break and yet another one 200 yards away to drink another Ensure I had forgotten to drink while in Nicasio. I usually don't do so many extra stops but I was fading a little. I did however manage to ride at a consistent pace all the way to Whites Hill. Did I mentioned it was cold? One more stop to have more plastic food (5-hr-energy drink thing and two Endurolyte capsules) and I felt much better. So far I hadn't eaten any "real" food all day, just synthetic stuff and the experiment was kind of working. Moved steady to the workers ride bonus control at the Sausalito 7Eleven. This control is necessary only on the workers ride to help prove to our RBA that we finish at the time we said we did by calculating the difference between that control and the final one at the Strauss Statue at the San Francisco side of the Golden Gate Bridge a few miles away. My guess is that the majority of riders take somewhere between 15-35 minutes to cover that distance, depending on how many miles they have on their legs and the weather conditions. I grabbed the first candy bar that I saw near the cashier, paid, got a receipt and jumped on the bike to do the final climb and the bridge span. At exactly 4:30 I was dismounting my bike at the final control; not a very fast time for me for this route but I felt it was good considering the freakingly cold conditions. Cold hands dialed the wife's number on the phone so she could pick me up to go to Point Reyes. While I waited Jack H surprised me with a visit; he had recently finished his ride after a long lunch in Fairfax. It was 42 degress! We chatted for a little while and then both went our way. Cold, cold brevet, the coldest I remember but lots of fun. Thanks to Max for dragging me to Inverness, to Greg for working the Point Reyes Lighthouse control and all other riders for the smiles. See you at the final control on Jan 22nd where I will be welcoming you at the bridge and listening to your stories. Hope it is warmer then.